You can tell I'm a little nervous by the way I ignore/forget about the camera after the shot and immediately walk over to the cart, already thinking about the next one. The tee shot (with a 5-wood) ended up clipping the trees on the right before bending back onto the right side of the fairway, very short. I ended up with a triple-bogey 8 on the par-5 opening hole, but followed that with a double, then a bogey, a par, and then very nearly a birdie (I missed about an 8-foot putt) on the short par-3 5th. After that I started thinking a little too much about scoring, instead of taking it shot by shot, hole by hole, but ended up with 49-53 for a 102. Not bad for the first time out! It could have been a little better (I wasted more strokes around the green than I would have expected), but it certainly could have also been a lot worse. I'll take it! Back in March, my son Jack and I attended the Milwaukee Journal-Sentinel Golf Show at Wisconsin State Fair Park. If you've ever been to a golf show like this one, you'll know that there are LOTS of opportunities to enter drawings. Jack, being 9, was very interested in trying to win some fabulous prizes. So I told him he could enter as many drawings as he likes as long as he fills out the entry slips himself. Surprise, surprise, that condition severely curtailed his interest in winning a new car or golfing vacation. But he did still manage to scrawl his name and contact information on a few entry forms. 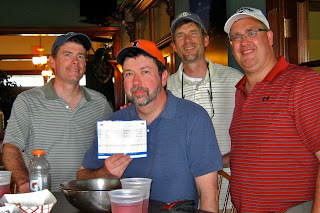 Much to my surprise, a few weeks later we got a call that Jack had won four free passes for 18 holes of golf at Morningstar! A few days after that, four coupons showed up in the mail – with no designated recipient and no fine print that I could see about them being "non-transferrable." Now, officially these passes belonged to my son, of course. But Jack is not ready to play such a course yet – nor did he seem to have have any particular interest in doing so anyway. So I made him a deal: I would take the passes off his hands in exchange for a new Wii Sports Resort game and the promise to take him to a "real" golf course (as opposed to a par-3) more his speed sometime soon. As long as it has sand traps, he said (he has a strange fascination with sand traps), that would be awesome. So I contacted three of my best golfing friends and set a date to join them at Morningstar for what promises to be a rollicking good time: nerve-wracking and challenging for me; entertaining and potentially hilarious for them. I expect they will show no mercy as I put my lefty game to its first official test. Nor would I want them to, as this is how golf is meant to be played: amidst the heckling and laughter of your best friends in the world.